Home / Blog / What is a tabletop RPG? As you may already know, role playing is akin to playacting. The referee, or gamesmaster, serves as a sort of actor/director, while the players portray the main characters. Everyone combines their imaginative talents to conceive a spontaneous story which is never short of action, intrigue and adventure. The easiest way to understand a role playing game is to think of it as a work of fiction such as a novel (or a play, or a movie, etc.). In a novel the author determines the setting of the novel along with the actions of all of the characters and thus the plot; however, in a role playing game, the author (called the Gamesmaster) only determines the setting and some of the basic elements of the plot. The actions of the characters (and thus the plot) are determined during the game by the game “players” and the Gamesmaster. Each of the “players” controls the actions of his “player character”, while the Gamesmaster controls the actions of all other characters (called non-player-characters). Thus each player assumes the role of (i.e. role plays) his character and the Gamesmaster role plays the non-player characters. In other words, a fantasy role playing game is a “living” novel where interaction between the actors (characters) creates a constantly evolving plot. The Gamesmaster also makes sure all of the characters perform only those actions which are possible within the framework of the setting that he has developed (his “fantasy world”). This is where the “fantasy” part and the “game” part come into the definition of a fantasy role playing game. A Gamesmaster creates a setting which is not limited by the realities of our world, and thus the setting falls into the genre of fiction known as “fantasy”. However, the Gamesmaster uses a set of “rules” which define and control the physical realities of his fantasy world. The use of these rules makes the process of creating the role playing “novel” into a game. Thus, a fantasy role playing game is set in a fantasy world whose reality is not defined by our world, but instead is defined by a set of game rules. 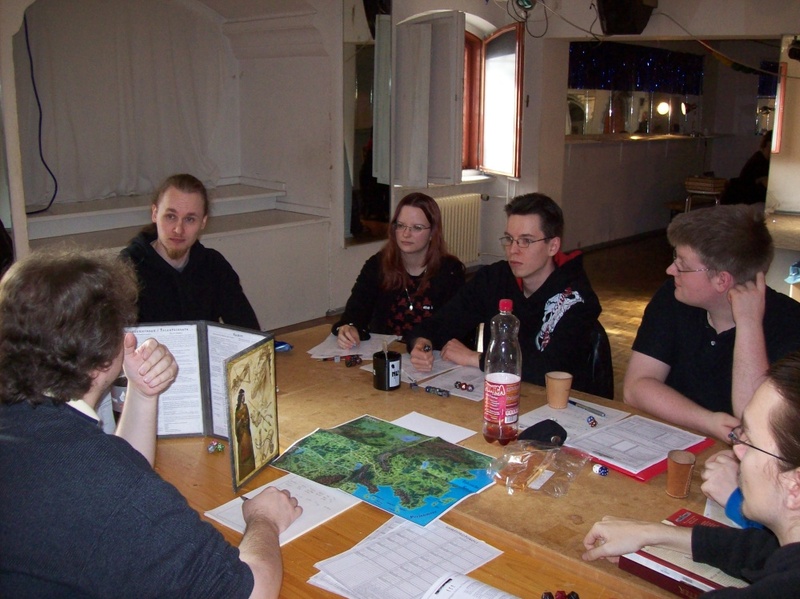 The creation of the plot of a role playing game is an on-going process which both the Gamesmaster and players may affect, but which neither controls. The plot is determined by the interactions between various characters and the game’s setting. since fantasy role playing is after all a game, it should be interesting, exciting and challenging. Thus one of the main objectives of a role playing game is for each player to take on the persona of his (or her) player character, reacting to situations as the character would. This is the biggest difference between role playing games and other games such as chess or bridge. A player’s character is not just a piece or a card; in a good role playing game, a player places himself in his character’s position. The Gamesmaster uses detailed descriptions, drawings and maps to help the players visualize the physical settings and other characters. In addition, each player character should speak and react to the other players as his character would. All of this creates an air of involvement, excitement, and realism (in a fantasy setting of course). The Gamesmaster has been described as the limited “author” of the game; actually, he functions as more than this. The Gamesmaster not only describes everything which occurs in the game as if it were really happening to the player characters, but he also acts as a referee or judge for situations in which the actions attempted by characters must be resolved. The Gamesmaster has to do a lot of preperation before the game is actually played. He must develop the setting and scenarios for play, much material concerning the setting and the scenario is known only to the Gamesmaster. In addition, the Gamesmaster plays the roles of all of the characters and creatures who are not player characters, but nonetheless move and act within the game setting. The players each develop and create a character using the rules of the game and the help of the Gamesmaster (for the character’s background and history). Each player character has certain numerical ratings for his attributes, capabilities and skills. These ratings depend upon how the player develops his character using the rules of the game. Ratings determine how much of a chance the character has of accomplishing certain actions. Many of the actions that characters attempt during play have a chance of success and a chance of failure. Therefore, even though actions are initiated by the Gamesmasters and the players during the game, the success or failure of these actions is determined by the rules, the characters’ ratings, and the random factor of a roll of the dice. Finally, a fantasy role playing game deals with adventure, magic, action, danger, combat, treasure, heroes, villains, life and death. In short, in a role playing game, the players leave the real world behind for a while and enter a world where the fantastic is real and reality is limited only by the imagination of the Gamesmaster and the players themselves.